One of the interesting states we would like to visit soon is the Wyoming state. During our road trip this year we planned to visit the famous Yellowstone, but the amount of time we have is not enough to get there. So we decided not to drive up to Wyoming. 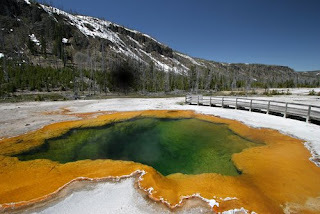 Here are some information about the Yellowstone Park. The only place in the world where a wild bison herd has survived continuously since prehistoric times. We've been here just this year. It is a good site, so much to see around. Hope you will enjoy.